Pixentia Resources | Datasheet on "Pixentia Program Marketing"
Companies need learning management to improve workforce efficiency, reduce costs and other strategic benefits that promote organizational agility. But it’s not often easy to make your learning and development application a transformative technology that drives better results. 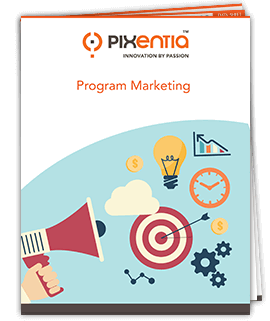 Pixentia Program Marketing Guidance helps you achieve goals with a right plan that suits the best. With an experience of vast promotional activities and detailed knowledge of communication opportunities, this resource enables you to transform your learning management system into a powerful marketing tool. Please fill form on right to download datasheet on title "Program Marketing"